New PEM concealed-head self-clinching studs and standoffs from PennEngineering install permanently in thin sheetmetal assemblies to provide strong and reusable threads for mating hardware while preserving a smooth and unmarred appearance on the side of the sheet opposite installation. The concealed-head feature satisfies strict ingress protection requirements in assemblies where a sheet must remain completely sealed from air, liquid, dust, gases and other potential contaminants. The fasteners install in steel or aluminum sheets as thin as 0.062 in. Studs—aluminum or stainless steel—are available in thread sizes 4-40 to 10-32 and M3 to M5, and in lengths from 0.250 to 1 in. and 6 to 25 mm. Stainless-steel standoffs are offered in thread sizes 4-40 to 1⁄4-20 and M3 to M6, and in lengths from 0.187 to 1 in. and 4 to 25 mm. Sheet preparation for installation requires only a blind milled hole to the recommended size and minimum depth. Using a Pemserter or other standard press, installation is simple: Place the fastener in the hole and apply sufficient squeezing force. 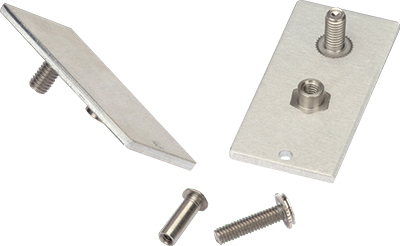 The fastener head then locks securely in the sheet and can handle substantial loads.